“The problem is that here there are two Perus: a Peru that is emerging and very competitive and a Peru that has been forgotten.” This recent statement by an official from Peru’s energy regulatory agency, OSINERGMIN, captures the plight and conviction of many people in the global South. How do developing countries successfully provide energy infrastructure for their “forgotten” populations? Why should we be concerned with this issue? Because providing rural citizens with energy is a point where technology, climate change, and human inequality intersect – where science-driven solutions, adaptation to warming global temperatures and the unforeseen challenges of development programs, converge and manifest in perceptible ways. In short, excluding inverters (which can cost between $30 to $150 USD each) from SHSs makes them cheaper, lessens the demand on the battery, and increases the technical sustainability of the system. However, most household appliances and medical devices, such as blenders, sewing machines and vaccine refrigerators function with AC power. The state-authorized SHSs (which cost about $700 USD) are only designed to provide in-home lighting, cell phone charging (via a car cigarette plug-in charger) and use of the few devices that may be compatible with DC power. As a result, the state has chosen to pursue a policy that favors clean energy and sustainability but does little for social and economic improvement. While the national electric grid provides urban energy users with 24-hour access to energy, the SHSs only provide rural residents with light and energy for 4-5 hours a day and precludes the use of common AC-powered household appliances. Lighting alone, however, will not aid in generating higher household incomes and raising standards of living. This situation highlights the contradiction of the state prioritizing the sustainability of energy equipment over the social and economic development of its citizens. 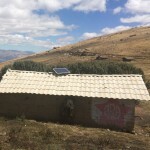 Recognizing the conflict between sustainability and development puts technology’s role in policy design into sharp relief, and ultimately, shows how these arenas can combine to improve the lives of rural Peruvian families. Conceivably, as research on energy storage advances, batteries will not only become cheaper, but longer lasting under the demands of DC to AC conversion. 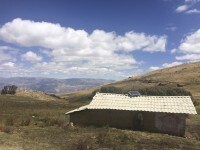 With the availability of more affordable, more durable batteries, the Peruvian government could amend their solar energy subsidy policy to allow SHSs to include DC/AC inverters. NGO officials and government agents alike have indicated this change would create the possibility for rural residents to utilize various potentially income-generating tools and appliances and expand beyond bare necessity energy use. This scenario shows how the contact zone between technology and policy is tangible and can have effects both immediate and enduring for real people in rural communities. Technician from a local NGO installing a solar home system. Rural household fitted with a solar home system. Dustin Welch García is a graduate fellow at the Clean Energy Institute. His research asks when and why NGO-led electrification programs catalyze innovation in large-scale, public/private solar energy projects. 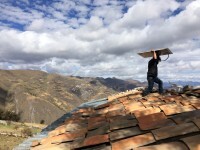 Using data from an NGO whose success has prompted the Peruvian government to electrify 500,000 homes via solar energy, Dustin offers an ethnography of the policy contact zone between state and non-state actors, both in the capital city and selected rural field sites. His research goals is to show how a state-society understanding of how energy policy is constructed and negotiated in Perú can generate insights into the politics of clean energy in other developing states.